Innovation in the mining sector isn’t as simple as making a product and releasing it. It is conceived from an idea or an issue, developed to a product stage and marketed to a larger audience to build a business. The core foundations for innovative success relate to the ability to be responsive, active and agile; not just in product design but in marketing and distribution. Hummingbird Electronics, based in Williamtown, New South Wales, specialises in bespoke products focused on improving driver and operator safety in the mining, council, fleets and civil construction sectors. Hummingbird’s products make vehicles more efficient to operate and safer to use. 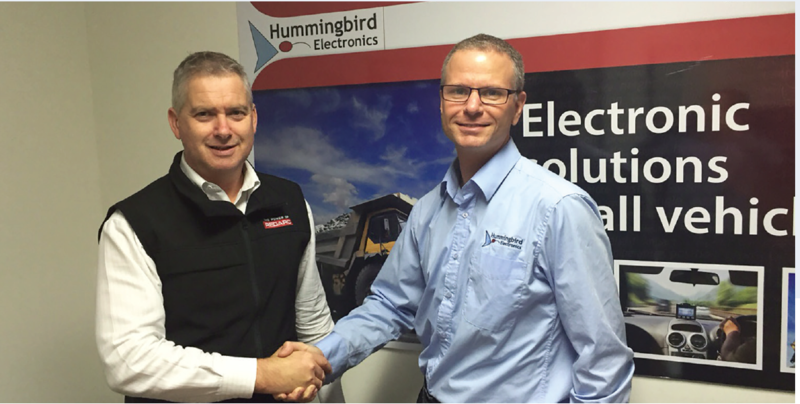 Hummingbird Electronics was established in 2010, when innovator and founder Normal Ballard identified a need for electronics to suit the Australian regulatory environment and environmental conditions. “The market for our products is a niche, it often gets overlooked by large multinational suppliers which makes it ideal for small to medium sized Australian manufacturers,” said Ballard. Hummingbird’s products are often created from ideas or problems that its customers are facing. This forces the company to investigate new and existing technologies and innovate. The most important factor is understanding the requirements of its customers through in-depth and thorough consultation. “We are determined to understand the problem, and in consultation with our customers we work to provide a solution that delivers the desired outcome at a cost that meets expectations. Once the scope of the project is understood, we prove development and costings then proceed to design,” Ballard said. Once the product has been designed, it undergoes rigorous testing to ensure that the product operates as required. A recent example of this is the design of a seat belt monitor which has been implemented into mining sites around the country. A large company came to Hummingbird with an issue relating to its operators not wearing seat belts. As a result, several near-misses and injuries had occurred. Hummingbird worked closely with the company to develop a battery monitored seat belt that simply sticks onto the seat belt assembly. The product allowed for a flexible and quick install, making it viable to fit to an entire vehicle fleet. Hummingbird has been able to grow by understanding a greater need for these products and identifying the potential for mass marketing appeal. “If we believe that a product will have a wide appeal, we will commercialise the product to a point where it is suitable for general use and will make it available to the Australian market through our website and greater distribution network,” said Ballard. All products are designed in-house by Hummingbird’s team of electronics engineers. The advantage of this is that Hummingbird can respond quickly to its customers’ demands. Should some customers require consultation, they can have the design team visit their site and work directly with them for the desired outcome. This was demonstrated recently when a change of legislation was introduced, requiring the additional monitoring of doors in buses. Because Hummingbird was local, it was able to respond with a solution quickly, allowing the client to modify their bus to comply with legislation, ultimately keeping their passengers safe. All Hummingbird products are manufactured in Adelaide and installed by a network of auto-electricians around the country. “By keeping our manufacturing in Australia, we are able to ensure consistent quality and availability of product,” Ballard said. For more information, contact Hummingbird on 1300 155 541 (within Australia), email info@hmbe.com.au or visit www.hmbe.com.au.